Underwater museum opens in Turkey Jump to media player Europe's first underwater museum opens in Antalya, Turkey. Underwater treasures go on display Jump to media player Rare ancient Egyptian artefacts discovered underwater are going on display in Paris for the first time. Ancient underwater forest found off UK Jump to media player New footage reveals a 'lost world' after the discovery of an amazing underwater forest thousands of years old underneath the sea off eastern England. Kapoor sculpture vandalised again Jump to media player A sculpture by Sir Anish Kapoor on show at France's Palace of Versailles has been vandalised and covered with slogans, some of which are anti-Semitic. China's ice castles open to public Jump to media player Some of the world's most breathtaking ice sculptures went on display on Monday at the 31st International Ice and Snow Festival in Harbin, China. Chocolate faces on arts prize list Jump to media player Leading modern artists from around the world are in Wales to find out if they have won the Artes Mundi prize. 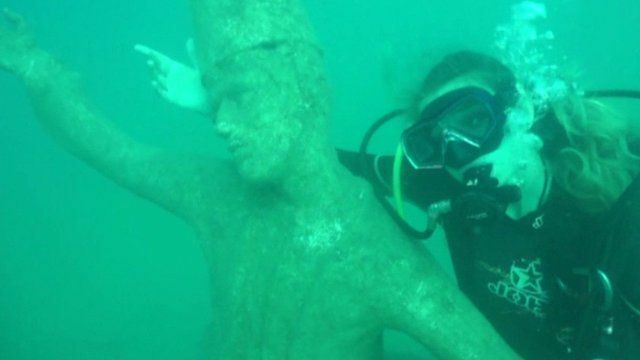 Europe's first underwater museum has opened in Antalya, Turkey. The Side Underwater Museum features 110 sculptures grouped under five themes, including 'Whirling Dervishes'. The sculptures, which are made of a special material which fosters coral life, have been lowered to depths of 7-12m, allowing both novice and experienced divers to view them.